REGISTRATION WILL OPEN DECEMBER 3, 2018 FOR ALL REGIONAL FESTIVALS. SAFT – January 19, 2019 at University of Arizona. NAFT – January 26, 2019 at Yavapai Community College (Prescott Campus). CAFT – January 26, 2019 at Mesa Community College (Dobson & US60). There are no changes after the deadline, drops will be allowed, however, there are no refunds. Please take some time to read the rules for the IE’s as there may have been changes. ALL SCHOOLS MUST BRING 1 JUDGE FOR EVERY 5 IE’S. Contact Regional Directors for information on Regional Festivals. Performance Standard Policy – must be on file for all published works. THE FORM IS LOCATED IN THE REGIONAL RULEBOOK. 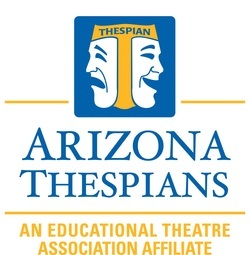 Arizona Thespians Code of Conduct – all schools must bring a signed copy to the Regional Festival they are attending. You can have all your students sign the back of one sheet for your convenience. BALLOTS HS National Individual Events 2018-19 COMBINED – every group/event you enter please bring three copies of your ballots to your room for the judges. Attendance – Schools receives points for attending Leadership Camp, State Acting Festival (November), Regional Acting Festivals, National Acting Festival. Leadership – Schools receives points for having a student and/or teacher on the State Board or the AIA Board. Honor Troupe – Schools receives 10 points for Gold, 5 for Silver and 3 for Bronze Honor Troupe Awards. Superior ranking – School receives a point for every Superior ranking at the Acting Festivals for IE’s, GE’s and Tech Challenge. State One Acts – Each School receives 5 point for Superior and 3 points for Excellent at the Regional and State One Act Festivals. Other – Schools receive points for other award such as, Governor’s Proclamation, Teacher or Principal of the year, Community awards, etc. as approved by the State Chairman.